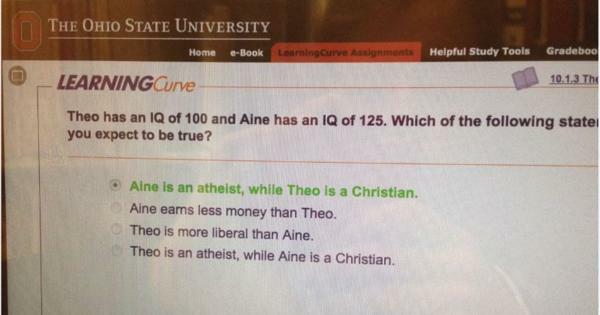 An Ohio State University psychology class is teaching that Christians have a lower IQ than atheists, revealed by Campus Reform with screenshots from the test question. Aine is an atheist, while Theo is a Christian. Aine earns less money than Theo. Theo is more liberal than Aine. Theo is an atheist, while Aine is a Christian. According to the school, the correct answer is option #1. The quiz question was purportedly part of an online homework set for Ohio State’s Psychology 1100 course. Psychology 1100, according to Campus Reform, is a general education requirement, which means many students from a variety of disciplines take the class each year. The anonymous student who first told Campus Reform about the quiz said that the question was unsurprising, considering the anti-Christian bias prevalent in many public universities. OSU has responded to this a week ago. Why are you not reporting on their response? What’s your agenda?